Millions of people appear on the Electoral Roll within the United Kingdom and every day many thousands of those people find that they are receiving information from companies, organisations and individuals they have never heard of or had contact with before. We look at the reasons for and against appearing on your Local Authority’s Electoral Roll. The Electoral Roll is a document that can be viewed publicly and details the names and addresses of those individuals who registered to vote at either the last elections or the forthcoming elections. Otherwise known as the Electoral Register the document can be searched for information that would be useful to companies or organisations who wished to target a particular demographic within a certain area. Until 2002 the Electoral Register could be purchased by any company who wished to make use of the information contained in it but now the register has been separated into two distinct versions, the full and edited versions. The full version is available to view at your local council office and the edited version is still currently available for general sale for use by companies looking for sales and marketing information – however this information is less specific than that contained in the full version. How Do I Know if I Am on The Electoral Roll? In the few months up to the last local elections in your area you will have – or the head of your household – will have received a form from the Electoral Commission asking for the names of all those occupants of the property of voting age to be listed. This information is what appears on the Electoral Roll unless the householder specifies otherwise. Unless you are in what is considered to be a high risk group then your details will appear on the register. You can check with your local council office who will allow you to view the Electoral Roll to see if your details are held on there although if you fall into one of the above mentioned groups you should automatically be excluded from it. Why Should I Appear on the Electoral Roll? If you are a householder or tenant then appearing on the Electoral Roll is a good idea if you are looking to engage in a contract which allows you to obtain credit. One of the searches carried out by any company or organisation looking to furnish you with credit is that of the Electoral Roll. The information on the Electoral Roll with give them an idea as to how long you have lived at your current address and whether or not you have spent much of the previous years moving from place to place. This allows the company in question to judge your risk potential i.e. : are you likely to receive a loan or credit from them and abscond to a new address without paying. Why Should I Refuse to Appear on the Electoral Roll? 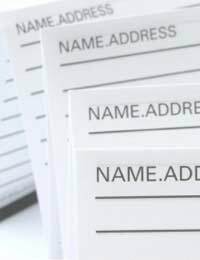 As we mentioned previously there are many companies and organisations that use the Electoral Roll as a means of obtaining information about potential clients such as addresses, names etc. This information is then used by these companies to send you unsolicited and unwanted communications and also this information can be sold to third parties without your knowledge. As we have already touched up you can refuse to have your information displayed on the Electoral Roll but can supply your local authority with the information they require. What you as an individual have to consider is whether at some time in the future appearing on the Electoral Roll may help you receive a loan, help with a mortgage or credit.